Since Steve Hamilton’s brand new thriller, The Lock Artist, is garnering lots of praise, I thought I’d take a look back at one of my favorite series, Hamilton’s Alex McKnight series. Hamilton began his writing career as the winner of the 1997 Private Eye Writers of America/St. Martin’s Press Award for Best First Mystery. A Cold Day in Paradise went on to win the Edgar Award and Shamus Award for Best First Novel. 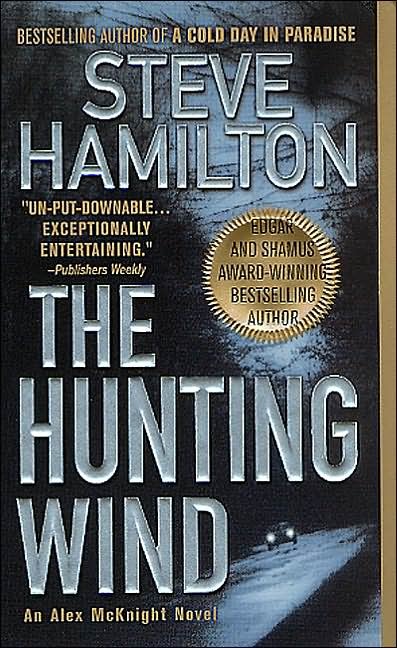 To date, Hamilton has written seven books in the series: A Cold Day in Paradise (1998), Winter of the Wolf Moon (2000), The Hunting Wind (2001), North of Nowhere (2002), Blood is the Sky (2004), Ice Run (2004), and A Stolen Season (2006). Alex McKnight is an ex-cop from Detroit, who retires to the quiet North Michigan town of Paradise after the violent shooting death of his partner. All he wants to do is be alone to contemplate his failed marriage and wallow in survivor’s guilt, and although he doesn’t look for trouble, it always has a habit of finding him. Unlike other ex-cop protagonists, Alex is a reluctant private investigator. I’ve always felt a kinship with Alex McKnight. All he wants is peace and quiet. It’s something that resonates with me. I love his bad attitude, his sarcastic humor, and his fierce loyalty to his friends. In the end, he’s a sucker like me. I also love how Hamilton writes about the beauty of the winters in Michigan’s Upper Penisula. The setting is so powerful that it’s just as important as any of characters in the story. What can be better than a hard-boiled crime novel set in the most lonely, out-of-the-way place you’ve ever known? Hamilton’s prose is sparse and understated. There’s not a lot of fluff in his stories. A bit disjointed, this book takes a while to get going. The mystery, about a missing old man, just isn’t that enticing, and the plot is overly convoluted. This just isn’t in the same league as the other books. In this outing, author Steve Hamilton takes us on a ride through Alex’s past, when he played minor league baseball. Driving through the streets of Detroit, Alex and his old baseball buddy, Randy Wilkins, are on a wild goose chase, looking for a girl Randy knew when he played for the Detroit Tigers. When Randy is shot, Alex doggedly searches for answers. The plot falls short because the set-up isn’t that believable, and the ending is too abrupt. Furthermore, Randy’s personality is quite annoying; I’m glad he got shot. An enjoyable read, but not Hamilton’s best. This time Alex McKnight gets mixed up with an Ojibwe woman named Dorothy, who asks for his help. Abused by her boyfriend, she just wants to get away. After staying the night in one of his cabins, she vanishes. Alex thinks her violent boyfriend may have kidnapped her and feels personally responsible for her disappearance. Fast-paced and an utterly enjoyable read, what makes this book so palpable is the stubborn way Alex almost dies in pursuit of the truth, not once but twice! Alex gets invited to a poker game at a private residence and when armed men break in and rob a safe full of money. Since he’s new to the game, the owner of the house thinks Alex is involved, but the Chief of Police thinks Alex’s friend Jackie organized the robbery. Out to clear his friend’s name, Alex stubbornly goes through all the suspects until he eventually discovers the real architect of the robbery. I like Alex’s tenacity, but the resolution is a bit too convenient. Even though it’s a good yarn, some of Hamilton’s endings just don’t fall neatly into place. North of Nowhere was short-listed for the 2003 Anthony award, Barry award, and Shamus award. McKnight isn’t like all those “smart” P.I.s out there; he often makes stupid decisions, reacts impulsively, and uses brute force. He always seems to think with his fists first rather than his head. This latest McKnight adventure sees him as happy as he’s ever been, and the reason is his girlfriend, Canadian Mountie Natalie Reynaud. As she goes undercover in Toronto to take down a gun smuggling ring, he constantly worries about her. Then she shows up in Paradise for a surprise visit only to be murdered. There’s raw emotion in the pages of this novel; McKnight has always been a sucker for a friend in need, but imagine what he will do for the woman he loves. In his first novel, Steve Hamilton, introduces readers to Alex McKnight, an ex-cop from the mean streets of Detroit. With a bullet embedded next to his heart, he retreats to the cold of Paradise, Michigan to hide away from life. Just as he finally finds solace, he stumbles across a murder scene, and the sight of blood stirs horrible memories of his partner’s death in Detroit. Then he receives eerie messages, which sound remarkably like the disturbed psycho who shot him and his partner fourteen years ago. This superb thriller catches you right from the start. Alex is an intriguing character—and his fear of the past grips you and sets the tone for an outstanding mystery. There isn’t a year that goes by that I don’t treat myself to a Steve Hamilton book. I give credit to The Hungry Detective for the idea of the “Very Best of” list. I completely agree with his Very Best of Dennis Lehane and Very Best of Michael Connelly posts. wondering if steve hamilton is writing anymore alex mcknight novels? Thanks for this – really enjoyed The Lock Artist and been wondering where to begin to check out his other works.